India's culture minister has offered to resign in a row over whether Hindu gods are mythological figures. Hindu devotees believe the area between India and Sri Lanka - now known as Adam's Bridge - was built millions of years ago by Lord Ram, supported by an army of monkeys. But scientists and archaeologists say Adam's Bridge, or Ram Setu, is a natural formation of sand and stones. On Wednesday the Archaeological Survey of India told the Supreme Court that the religious texts were not evidence that Lord Ram ever existed. Hardline Hindu opponents of the government accused the administration of blasphemy and protesters carried out demonstrations in the area and in Delhi, Bhopal, and on a number of key highways. The next day the report was withdrawn. 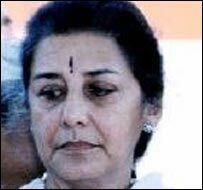 Ms Soni told reporters on Saturday: "If the prime minister of India... would feel that I am culpable and wants me to resign, it won't take me a minute to do so." Ms Soni said the directors had been suspended because they had ignored a revision she had made to the affidavit. She said an inter-departmental investigation was now under way to find out who was responsible. 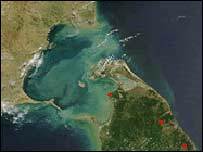 The government wants to build a canal to link the Palk Strait with the Gulf of Mannar by dredging a canal through the shallow sea. The $560m Sethusamudram Ship Canal Project is expected to provide a continuous navigable sea route around the Indian peninsula.